You'll be £6.00 closer to your next £10.00 credit when you purchase Survivors of Stalingrad. What's this? In November 1942, as the Battle of Stalingrad continued to rage, the Red Army launched a devastating counter-attack from outside the city. The Soviet forces smashed the German siege and encircled Stalingrad, trapping some 290,000 soldiers of the German 6th Army inside. For almost three months, during the harshest period of the Russian winter, the besieged German troops endured atrocious conditions. Freezing cold and reliant on dwindling food supplies from Luftwaffe air drops, thousands died from starvation, frostbite or infection, if not from the fighting itself. This important work reconstructs the grim fate of the 6th Army in full by, for the first time, examining the little-known story of the field hospitals and central dressing stations. The author has trawled through hundreds of previously unpublished reports, interviews, diaries and newspaper accounts to reveal the experiences of soldiers of all ranks, from simple soldiers to generals. The book includes first-hand accounts of soldiers who were wounded or fell ill and were flown out of the encirclement; as well as those who fought to the bitter end and were taken prisoner by the Soviets. They reflect on the severity of the fighting, and reveal the slowly ebbing hopes for survival. Together they provide an illuminating and tragic portrait of the climactic events at Stalingrad. This is a book that sheds light upon the best and worst of the human condition. It stands as testament to the baseness of mankind as well as the astonishing levels to which it may rise; both its greatest strength and its limitation. Busch’s book is disturbing and thought provoking and is a memorial to those who sacrificed for their country and their comrades. Highly recommended for the depth and range of first hand accounts it includes, this title was originally published in German in 2012 as Der Untergang der 6. Armee. Beguiling in its honesty and the matter of fact tone of the accounts. I find it amazing the hold that the Nazi regime had over these men and their willingness to go through such hardship for the cause. No bitterness and very little rancour. They saw it as doing their duty for the fatherland. Ordinary men placed in an extraordinary set of circumstances. like the recently published "Soldaten" a great although brutal collection of recollections vital to the understanding of the conflict on the Eastern Front. The account of a Russian nurse transfusing her own blood into the shattered body of a German soldier, saving his life, will live with me for a long time. Excellent. A very moving, sometimes disturbing book in which Stalingrad veterans relate the immeasurable degradation and good or bad fate they experienced in this most savage of battles. The integrity of the participants when writing down their personal stories only adds to the power of this book. You will remember this book long after you have put it in your book shelf! 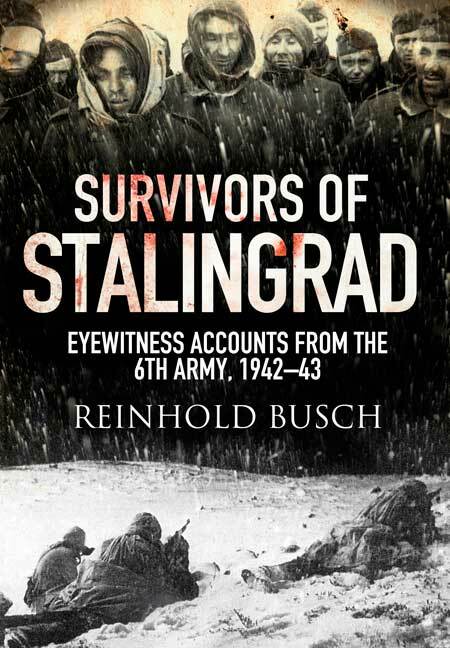 'Survivors of Stalingrad' underlines the grim determination of the Germans. Busch has done a commendable job in compiling a range of accounts, many from the relatively lower ranks. The result is a solid if disquieting addition to the literature on Stalingrad. REINHOLD BUSCH was born in 1942 in Metz, Lorraine. He graduated in medicine in 1967 and practised as a doctor for several years. Since 1995, Busch has conducted research on the health services of the Wehrmacht during World War II, and has authored several publications on the subject.